Bandula Warnapura (Sinhala:බන්දුල වර්නපුර) (born 1 March 1953) is a former Sri Lankan cricketer and captain of the Sri Lankan cricket team. He played 4 Test matches and 12 One Day Internationals (ODI) during his international cricketing career from 1975 to 1982. He was a right-handed opening batsman and a right-handed medium pace bowler. Warnapura captained Sri Lanka's first Test match, and also faced the first delivery and scored the first run for his team. He captained Sri Lanka in all the Tests he played, although he could not lead his team to victory in any of them. However, Sri Lanka won the first ODI match he captained. He has scored one half-century in ODI cricket. Warnapura was the first Sri Lankan Test cricket cap. got the opportunity to lead the Sri Lanka national cricket team in their very first Test match, which was played against England in 1982. The five-day match started on 17 February 1982 at the Paikiasothy Saravanamuttu Stadium. Warnapura and English captain Keith Fletcher made the toss in the morning, which was won by Warnapura. He elected to bat first, and opened the batting for Sri Lanka with Sidath Wettimuny. He faced the first delivery of the match, and scored the first Test run for his country. According to a local newspaper, he was even the first Sri Lankan batsman to get hit on the chest. However, he was dismissed for only 2 runs, when he was caught by David Gower off the bowling of Bob Willis. The first player to bat in a Test match for Sri Lanka had faced 25 deliveries during the 35 minutes he batted. During the Sri Lankan second innings, Warnapura made 38 runs off 155 deliveries – the second highest score in that innings. England won the match, and Warnapura's 38 would remain as his highest Test individual score. Warnapura's fourth and last Test match was against India in September 1982. He was unsuccessful again, scoring just 4 in the first innings and 6 in the second, and the match ended in a draw. During his Test career, Warnapura captained the Sri Lankan side in all four matches he played. He had scored a total of 96 runs, with an average of 12.00. Warnapura was the 11th Sri Lankan ODI cricket cap. His One Day International (ODI) debut was against West Indies on 7 June 1975, in a 1975 Cricket World Cup match that was also Sri Lanka's first ODI. He was dismissed for 8 runs in that match, which Sri Lanka lost. He was given the captaincy of the team to temporarily replace Anura Tennekoon (who was injured) in his fifth match, which was played against India on 16 June 1979, as part of the 1979 Cricket World Cup. He led the team to victory, scoring 18 runs in the match and taking a wicket. It was also the only victory in the series by an Associate Member nation (Sri Lanka had not yet gained Full Member status) in the tournament. In 1982, Warnapura was appointed captain of the Sri Lankan team. He made his first and only half-century against Pakistan on 12 March the same year. He made 77 runs in that match, although it was lost by Sri Lanka. Warnapura played 12 ODI matches, accumulating a total of 180 runs at an average of 15.00. He also captured 8 wickets at an average of 39.50, as well taking 5 catches during his career. Disputes had arisen among members of the Sri Lankan team and its administration only a few months after Sri Lanka's inaugural Test match. This resulted in a "rebel tour" of apartheid South Africa (which was banned from international cricket at the time). 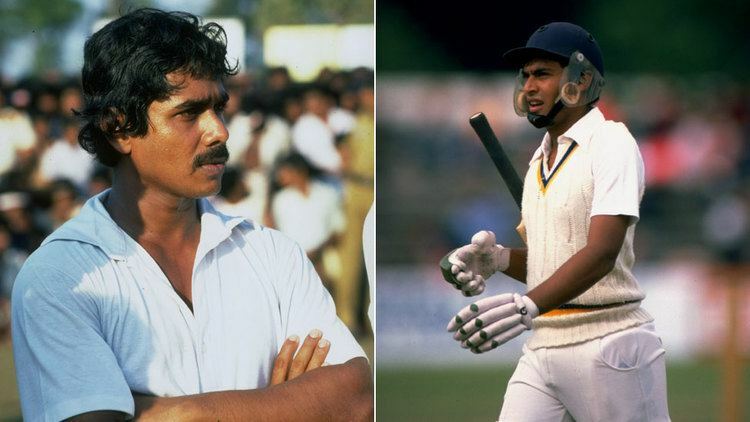 Several Sri Lankan players took part in this tour, and the team which was captained by Warnapura and named Arosa Sri Lanka, left the country in secret in September 1982. The tour was unsuccessful; Arosa Sri Lanka played 12 matches and lost 10 of them, while the other two ended in draws. As a result of this tour, the Board of Control for Cricket in Sri Lanka (BCCSL) imposed 25-year bans from all forms of cricket on all Sri Lankan players who participated, including Warnapura. Although the ban was revoked after nine years, Warnapura did not play international cricket again. He later claimed that not only financial issues but pressure from some members of the BCCSL forced them to undertake the tour, and expressed disappointment at the fact that no formal inquiry was held. His career came to a controversial end when he received a ban from cricket for participating in a "rebel tour" in 1982. Although the ban was later revoked, he did not play international cricket again. Warnapura participated as a judge in the reality show Youth With Talent telecasted by Independent Television Network in 2016-17.